Gift-giving is one of the great joys of the holiday season, and each year we compile a list of some of the year's best new offerings from violinists for you to consider in your holiday gift-giving, gift-asking — and post-holiday loading of the Kindle, iPod or other device! We hope this allows you to consider a music-related gift. We would also suggest considering supporting your local live music scene by purchasing tickets to local music events or simply making a year-end donation to a musical non-profit of your choice. I've tried to be inclusive, but I'm sure I have missed some ideas, so please feel free add your suggestions in the comments section. And yes, in this case, you are allowed to toot your own horn and recommend your own CD or book or product! You may also wish to refer to our gift-giving guides from previous years; I've listed links to those at the end of this blog. Many of the recordings below are linked to Amazon.com. Note that if you follow these links and make a purchase from Amazon, a portion of that will go to support Violinist.com. And whenever you buy any of these selections, from any source, you'll be helping to support the musicians and other artists who created them. Happy holidays, and may your season be filled with good music! Robert Schumann's Violin Concerto, neglected for so long, seems to be gaining popularity these days. If you have never heard it, this recording is a great place to start, paired with the Mendelssohn Violin Concerto. A soothing album of the best instrumental lullabies around. 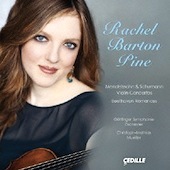 Rachel Barton Pine was inspired to assemble an album of lullabies, berceuses and wiegenlieds after the birth of her daughter, Sylvia. This is Frank Almond's homage to the beautiful instrument he plays, the 'Lipinski" Stradivari. It includes music that might have been played on the fiddle by its past owners, such as Tartini's Devil's Trill Sonata, Julius Rontgen's Violin Sonata, Karol Lipinski's Caprice Op. 29 No. 3, and Schumann's Violin Sonata No. 2. 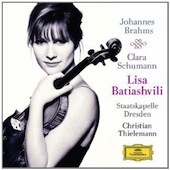 It's one of the most intriguing relationships in classical music, between Johannes Brahms and Clara Schumann, and Lisa Batiashvili performs music of both composers. Clara Schumann's works rarely are played or recorded, so here's also a chance to explore some works by a female composer of the Romantic era. The 'Cypresses' are a set of 12 love songs scored for string quartet, and the work after which the Cypress String Quartet is named. It's Joshua Bell's holiday album, featuring familiar holiday music -- classical, sacred and secular. Its wide range reflects Joshua's mixed background -- his late father was a former Episcopal priest and his mother is Jewish. He collaborates with artists of many genres, including Alison Krauss, Chick Corea, Branford Marsalis, Renee Fleming and classical comedy duo Igudesman-Joo, to name a few. For something a little non-classical and experimental, with a Latin flavor, featuring Los Angeles-based violinist Javier Orman. French music, played with refinement and authenticity -- that's this album. 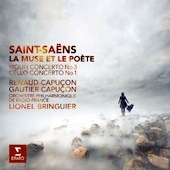 French violinist Renaud Capuçon performs Saint-Saëns' Violin Concerto No. 3; his brother Gautier performs Saint-Saëns Cello Concerto No 1; and the brothers join forces to perform La Muse et le Poète. Concertmaster Aisslinn Nosky performs Haydn's Violin Concerto in G minor, with the Handel and Haydn Society Orchestra, a period-instrument group conducted by Harry Christophers. Founded in 1815, the Handel and Haydn Society is America's oldest continuously performing arts organizations, and they do a fine job of, in their words, "blowing the cobwebs off" off this work, as well as Haydn's Symphonies No. 6 Le matin and No. 82 L'ours. This recording explores the quiet combination of violin and guitar, with performances of versions of Sarasate's Zigeunerweisen; Paganini's Moses Variations; Piazzolla's Histoire du Tango; and Manuel de Fallas' Canciones Populares Espanolas. An excellent live performance of all works for solo violin: The Red Violin Caprices (five of them) by John Corigliano; "Arches" by Kevin Puts; three of Astor Piazzolla's Tango Etudes; Milstein's "Paganiniana Variations"; and Bach's D minor Partita. The classically-trained violinist Judy Kang, who also toured for several years as "Lady Gaga's violinist," has released an album of her own highly creative works of pop and electronica. Anne-Sophie Mutter plays the Dvorak Violin Concerto, Romance and more with the Berlin Philharmonic, conducted by Manfred Honeck. If you want to see what contemporary composers are writing these days, this recording provides a sort of tasting menu for both listeners and musicians, with 27 new, short-length pieces for violin, all by living composers. These "Encore" pieces are the result of the major commissioning project that Hilary put in motion in 2011. She performs them all with pianist Cory Smythe. This brother-and-sister team recorded all the Brahms Sonatas in London's Wigmore Hall. Dutch violinist Janine Jansen takes her love for chamber music and collaboration and made a recording of both Bach's most famous violin concertos (the A minor and E major), as well as the Violin and Oboe Concerto in C minor and Sonatas for Harpsichord and Violin, No. 3 and 4. This recording of works by Leos Janacek, Bela Bartok and Gyorgy Kurtag explores the musical language that resulted from the pull between modernism and folk music. 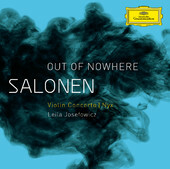 This recording of Esa-Pekka Salonen's Violin Concerto was just nominated for a Grammy. Music that was either written for, or used in, film. It also includes the sunny and appealing Violin Concerto in D, Op. 35, by Erich Wolfgang Korngold. British violinist Tasmin Little's new recording has been moving up the classical charts in the U.K.; it includes her performances of Ernest John Moeran's Violin Concerto; Gustav Holst's A Song of the Night; premiere recordings of three works by Edward Elgar and arranged by Roger Turner for violin: Chanson de matin, Chanson de nuit and Salut d'amour; and of course, Ralph Vaughan Williams' The Lark Ascending. A tasteful and beautifully-executed performance the Brahms with Riccardo Chailly and the Gewanhaus Orchestra. Also includes Bartok Rhapsodies and Brahms Hungarian Dances with pianist Peter Nagy. For the fiftieth-year anniversary of Paul Hindemith's death, Midori recorded Hindemith's Violin Concerto, with Christoph Eschenbach and the North German Radio Symphony Orchestra (NDR Sinfonieorchester). This recording was just nominated for a Grammy, in the category of Best Classical Compendium. 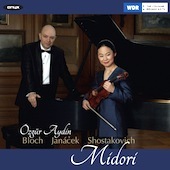 Here is a brand-new recital disc by violinist Midori Goto, with pianist Ozgur Aydin, with sonatas by Ernest Bloch, Jelos Janacek and Dmitri Shostakovich. A very appealing album of classical melodies that work so well on the violin: Gluck's Melodie de Falla's Spanish Dance, Heifetz' arrangement of Gershwin's Porgy and Bess Suite and more, including some of Quint's own arrangements. Soviet composer Dmitri Shostakovich turned the string quartet into an epic genre -- his quartets are considered by some to be the very pinnacle of the genre. 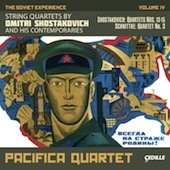 The Pacifica Quartet this year completed a four-disc project in which they recorded them all, pairing them with quartets by Soviet contemporaries: Sergei Prokofiev, Alfred Schnittke, Nikolai Miaskovsky and Mieczyslaw Weinberg. This is one of the most thoughtful musical programs of the year, with a choice of music that puts the focus on issues of musical innovation and artistic suppression. Beyond Zack's very fine playing, his program notes are enlightening and thought-provoking. The album includes works by Paul Hindemith (complete works for solo violin); J.S. Bach; Max Reger and living German composer Klaus Hinrich Stahmer. 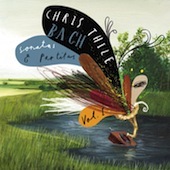 Virtuoso mandolinist Chris Thile gives us violinists a lot to think about with his recording of Bach Sonata No. 1 in G minor and Sonata No. 2 A minor, and Partita No. 1 in B minor. These works were written for solo violin but sound quite fresh, even heavenly, on the mandolin. How about some New Age violin music? This recording of works by Sean Christopher Dockery is unique in that it includes acoustical violin, featuring Cleveland-based violinist Andrew Sords. If you are a Heifetz fan, here's something for you: a very detailed, 475-page book about Jascha Heifetz remarkable childhood as a prodigy, focusing on his first years in Russia. It includes photos, programs, and all kinds of interesting information, and reading it brings one back to the very different world of the early 20th century. In the next few weeks, Violinist.com will be releasing its first publication, a compilation of favorite interviews by Violinist.com Editor and Founder Laurie Niles (me! 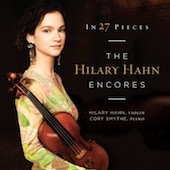 ), with a forward by Hilary Hahn. Violinists featured in Volume 1 will include Hilary Hahn, Ruggiero Ricci, Anne Akiko Meyers, Rachel Barton Pine, Joshua Bell, Anne-Sophie Mutter, James Ehnes, Janine Jansen, Tasmin Little, Philip Setzer, Gil Shaham and Adele Anthony, Augustin Hadelich, Sarah Chang, Zach De Pue, Simon Fischer, Clara-Jumi Kang, Lara St. John, Anne-Sophie Mutter, Nicola Benedetti, Philippe Quint, Nadja Salerno-Sonnenberg, Judy Kang, David Garrett, Leila Josefowicz and Esa-Pekka Salonen, Stanley Ritchie, Maxim Vengerov and Elmar Oliveira. An encyclopedic, two-volume textbook on orchestra playing for violinists, published by Barenreiter. Atlanta-based violinist and arranger has written duet parts most of the pieces in the Suzuki Books -- something very helpful for teachers, parents and students who wish to play duets. She has more than Suzuki arrangements, too, she has some great gig music: violin duet, violin-cello duet and double-stop solo arrangements for wedding music, church hymns, Christmas music, American melodies and more. I have been using her Suzuki duets at just about every lesson I teach; highly recommended! Even some of the best players in the world can't really explain, in detail, what they are doing on the violin, how they are doing it or why it works. But when a student is struggling, or when a student wants to reach a new level of playing, this explanation can make all the difference. Fortunately for teachers and for students, UK violinist and pedagogue Simon Fischer has compiled an entire book of such explanations: "The Violin Lesson." Still haven't found the right gift? Check out our gift-giving guides from previous years, which also include recent releases and violin-related projects by current-day violinists, composers and authors! If you would like to consider a music-related gift other than recordings or books, please visit our Violinist.com Business Directory, and support the music businesses that support our Violinist.com community.